I spend most of my time teaching people the basic concepts and skills of data visualization. You can’t learn data visualization by memorizing a set of rules. You must understand why things work the way they do. Stated differently, you must understand data visualization on a conceptual level. To engage in data sensemaking, which is central to data visualization, you must be able to think statistically. This doesn’t mean that you must learn advanced mathematics, nor can you do this work merely by learning how to use software to calculate correlation coefficients and p-values. Thinking statistically involves an understanding of the basic concepts of statistics. Most books about statistics, even introductory textbooks, do a horrid job of teaching these concepts in a way that makes sense. People who are immersed in statistics often have a hard time remembering how to talk to people who are not. Because statistical thinking is so central to the work that I do, I am constantly on the lookout for books that teach the essential concepts of statistics well. I am happy to announce that I’ve just found the book that does this better than any other that I’ve seen: Naked Statistics: Stripping the Dread from the Data, by Charles Wheelan (W. W. Norton & Company, 2013). This is a marvelous book. If you’re a fan of the classic How to Lie with Statistics by Darrel Huff (1954), as I am, this is its rightful heir. Wheelan teaches public policy and economics at Dartmouth College and is best known for a similar book written several years ago titled Naked Economics. In Naked Statistics, he selects the most important and relevant statistical concepts that everyone should understand, especially those who work with data, and explains them in clear, entertaining, and practical terms. He wrote this book specifically to help people think statistically. He shows how statistics can be used to improve our understanding of the world. He demonstrates that statistical concepts are easy to understand when they’re explained well. If you grow faint at the sight of mathematical notation, as I do, this is the book for you. Wheelan is in a good position to empathize with us. He hated calculus in high school. Why? In hindsight, I now recognize that it wasn’t math that bothered me in calculus class; it was that no one ever saw fit to explain the point of it. If you’re not fascinated by the elegance of formulas alone—which I am most emphatically not—then it is just a lot of tedious and mechanistic formulas, at least the way it was taught to me. The paradox of statistics is that they are everywhere—from batting averages to presidential polls—but the discipline itself has a reputation for being uninteresting and inaccessible. Many statistics books and classes are overly laden with math and jargon. Believe me, the technical details are crucial (and interesting)—but it’s just Greek if you don’t understand the intuition. And you may not even care about the intuition of you’re not convinced that there is any reason to learn it. Wheelan explains most of the statistical formulas in chapter appendices so you can easily skip them if you wish. Statistical terms are introduced throughout, but only when necessary and always in ways that make perfect sense. The real-world examples that Wheelan uses to explain statistics are all interesting and familiar. Because statistics and the scientific method are intimately intertwined, Wheelan talks a great deal about social science and how researchers use statistics to test hypotheses and validate findings. He even explains the “null hypothesis” in a way that will make you sit up and pay attention, which is quite a feat. If you think this isn’t relevant to you because you’re a business data analyst, think again. Even in business we should be formulating and testing hypotheses rather than making judgments based on intuition alone. What is the point of learning statistics? To summarize huge quantities of data. To answer important social questions. To recognize patterns that can refine how we do everything from selling diapers to catching criminals. To catch cheaters and prosecute criminals. To evaluate the effectiveness of policies, programs, drugs, medical procedures, and other innovations. And to spot the scoundrels who use these very same powerful tools for nefarious ends. If you read this book, you’ll come to understand statistical concepts and methods such as regression analysis and probability as never before. I have many statistics books in my library. I’ve read them all. Not until I read Naked Statistics, however, did some of the concepts that I’ve contemplated dozens of times come to life for me. 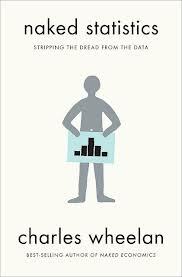 Even if you’re a statistician, you should read this book. It could help you explain what you do to others in a way that they can finally understand and appreciate. This book was written to improve human judgment through better statistical thinking. In the final sentence, Wheelan says something that is almost word-for-word what I often say at the end of lectures and classes: “Go forth and use data wisely and well!” I heartily recommend this book. Kaiser Fung’s book is good, but Naked Statistics does a much better job of explaining the concepts of statistical thinking. This book sounds great! I usually recommend Larry Gonick’s _Cartoon Guide to Statistics_ to people who need an introductory text, but this sounds like it might be a better option. I’ve been looking for a good intro to statistics ever since I read John Allen Paulos’ _Innumeracy_. I found Larry Gonick’s book useful as well, but Naked Statistics is better. Thanks for the recommendation. I’m getting a lot out of it and having a few good laughs at the same time. Great examples. As you said, he does a great job of making you want to learn the next concept before he gives it to you. By the time he slips in a formula you’re more than ready for it. This will help with explaining as well as grasping the concepts more solidly myself. Thank you for the recommendation. I’ve been reading and enjoying this book. Great recommendation. Wheelan’s memories of calculus echo my own from college. I just ordered my copy. Fung’s book provides a good overview for understanding the complexities of statistical concepts in our every day lives, but I’ve been looking for a companion to Huff that offers a more pragmatic resource at work. Glad to add ‘Naked Statistics’ to my desk. Anyhow, something any #BigData guy/gal should read! Hold on, let me correct myself: A book any #BI guy/gal should read!